The protesters held up the Labour bus for about 10 – 15 minutes, a party spokesperson said. The protesters during the Pride parade. 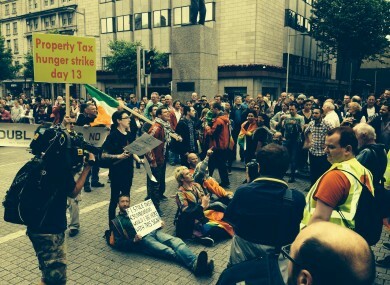 A LABOUR PARTY bus taking part in the Dublin Pride parade was delayed after a number of anti-property tax and Anglo tapes protesters stood in front of it as it made its way along O’Connell street. A spokesperson from the Labour Party told TheJournal.ie that participants on the float for the parade – which celebrates Ireland’s LGBT community – told him that about 12 or 15 protesters positioned themselves in front of the bus and “refused to move”. They were there for about 10 – 15 minutes, he said, and gardaí came along and moved them on. He said that on a day when people are celebrating gay pride, the protesters disrupted the parade, “which is reprehensible”. However, he said that after the protesters were moved on, the rest of the Labour bus’s journey along the parade route went smoothly. He described the incident as “disappointing” but said he doesn’t think it is going to dampen people’s enthusiasm for Dublin Pride. A garda spokesperson said there have been no arrests at the parade. Email “Video: Protesters stop Labour float during Dublin Pride parade”. Feedback on “Video: Protesters stop Labour float during Dublin Pride parade”.